A stunningly presented collection of twenty-five illustrated short stories exploring the relationship between humans and animals, from award-winning visual storyteller Shaun Tan. World-renowned artist Shaun Tan applies his extraordinary talent to a reflection on the nature of humans and animals, and our urban co-existence. From crocodile to frog; tiger to bee, this is a dark and surreal exploration of the perennial love and destruction we feel and inflict - of how animals can save us, and how we are entwined, for better or for worse. 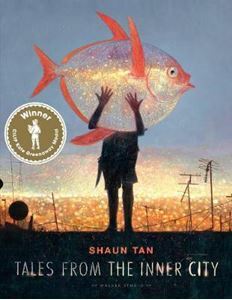 Tales from the Inner City is a truly masterly work, bearing all of Shaun Tan's trademark wit and poignancy in both its prose and exquisite illustrations.